The Ken Head story stretches from pond hockey and Johnny Macdonald's natural ice in the breezy Wapiti Arena to the era of artificial ice and today’s comfortable and fancy arenas; forty-five years of hockey history. He was born in Grande Prairie in 1929 where his sparkling talent and rugged qualities as a player developed. Playing for D-Company during the war years, he thrilled Grande Prairie fans with his puck handling skills and scoring touch. As a junior, he moved to Edmonton where he played for the highly regarded Edmonton Athletic Club (EAC) and then moved to the International Hockey League as a Paisley Pirate. Back in Grande Prairie, Ken assumed the role of playing coach for the Athletics, winning numerous All Star awards. In addition to his playing skills, Ken is remembered for more than three decades of coaching that included the Athletics, Junior North Stars, midget, and bantam teams. In 1989 he was instrumental in organizing ACAC hockey at the Grande Prairie Regional College and was coach of the Grande Prairie Regional College Wolves until 1991. Ken coached Doug Rigler (Legend – player category) when he played for the Junior North Stars and Doug reports that Ken “ was one of the best coaches I ever had throughout my whole career. He was soft spoken but intense”. Doug took to heart Ken’s warning about excessive partying, bar-stool sitting and eating barley sandwiches, their term for a beer that Ken pointed out had the same calories as a sandwich. Ken prepared Doug well for his professional career. Other contributions included bringing the Provincial midget hockey championships to Grande Prairie in the 1960s and 70s, organizing hockey exchanges to Alaska, and planning a trip to Switzerland for the G.P. Old-timers. He worked to create the Hockey Certification program by bringing a level three coaching clinic to Grande Prairie and played a major role in the development of a four-level coaching certification system that was adopted by the Canadian Amateur Hockey Association. Ken was recognized in 1967 as the Alberta Commercial Traveler’s Association Sportsman of the Year and was further honored in 1988 with the prestigious Certificate of Merit from the Government of Canada for his contribution to the community. An additional highlight of his career came in 1973 when he was selected by the Alberta Government to conduct coaching clinics and hockey schools for high school students in Kushiro, Japan. Ken has encyclopedic knowledge of Grande Prairie hockey history, is a charter member of the Legends Committee and continues to be a staunch supporter of its’ activities. 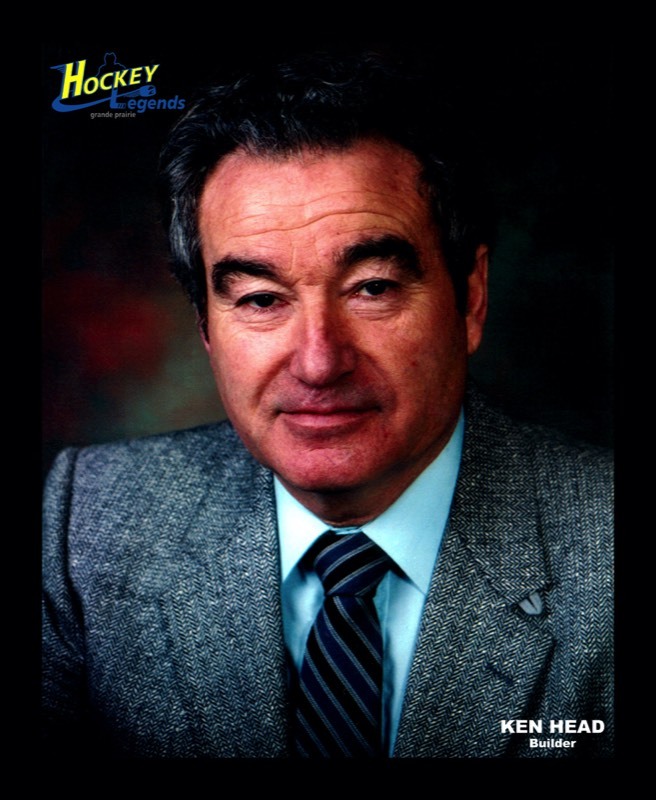 Ken Head - a Grande Prairie Hockey Legend in 2004.